I want to be able to just insert a DVD movie and be sure I'll have full access to all its features. - Can this be done without VLC in Linux? 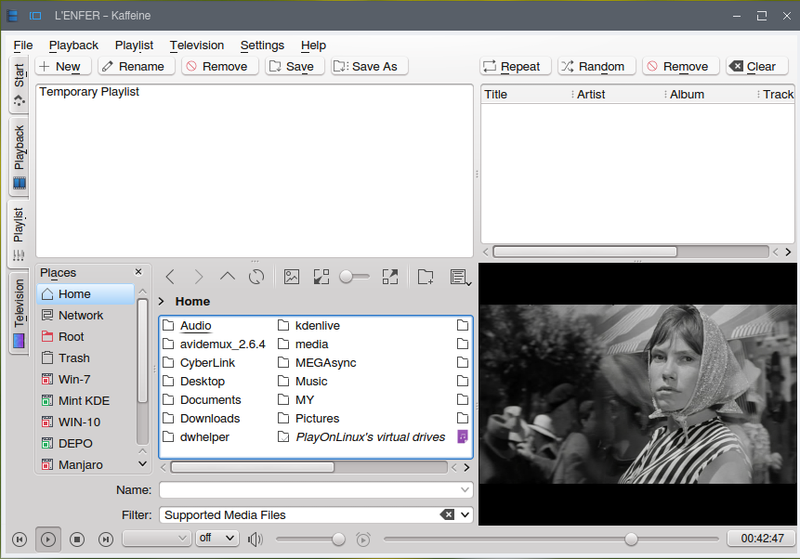 VLC is maybe the best video player out-there and as far as I can tell the best DVD player for Linux, but it may happen that it fails from time to time (I sometimes lose video, audio, or synchronization between those) - so that it may be useful to know if there is a way to have full access to all features of a DVD movie with a different application. This example is in VLC. Can other player do as well as this? Or better: I remember that in Windows I used players that at any moment during playback were able to show the first level of the menus by selecting a specific option. I cannot seem to find that in VLC neither - clicking the 'DVD Menus' added to the interface, it will just restart from the beginning. What happens when trying the same DVD with a different player? Well, many video players don't even have an "Open DVD" option. SMPlayer has that option, shows the first level of the menus but does nothing then (it seems to see the menus just as a video stream or something). Gnome MPlayer also has it, but cannot find the dvd as it looks for it by default in /dev/dvd and it doesn't have a way to change that. 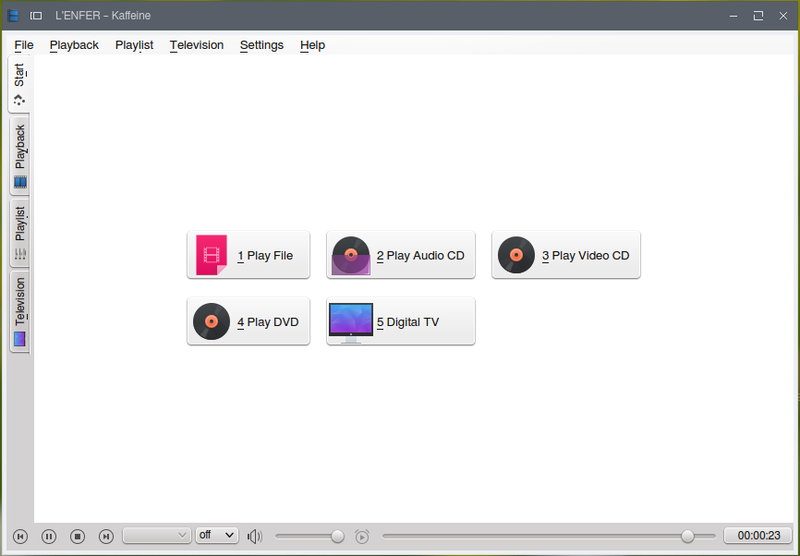 When starting the DVD in this player anyway, it treats menus as video stream. Even without an "Open DVD" option I was able to test with other players. Totem player was able to display the first level of menus just like VLC but clicking any of them was just starting the first entry. Kaffeine - a KDE-specific player, comes with some KDE dependencies. In KDE it is nicely integrated with the rest of the desktop and the file manager, but it works well in other desktops too. It is able to show the menus just like tested in VLC. It seems not as actively supported as VLC and at some point it proved unstable (closed out of nowhere) but all around a very impressive tool, especially as it can switch between menu and video back and forth with one context menu click, something VLC cannot do. Xine - as also indicated in a comment to the question - can do the job too. 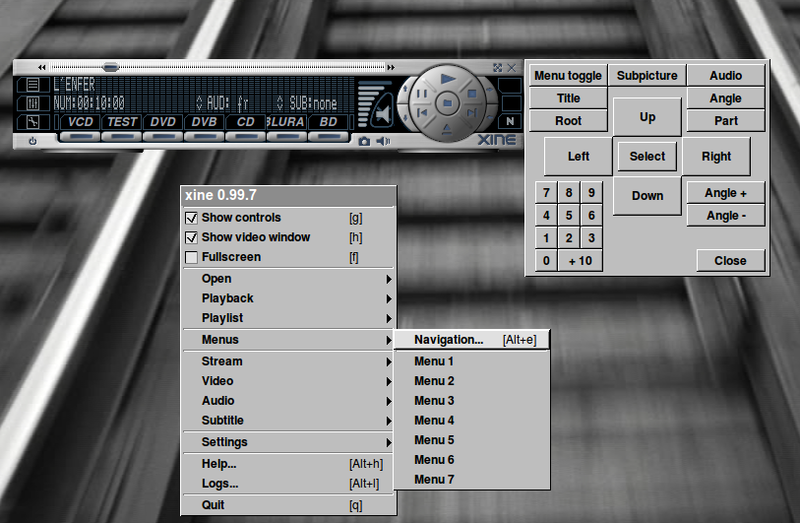 The menu navigation is even more advanced than in Kaffeine, as the Xine-GUI seems very DVD-orriented. 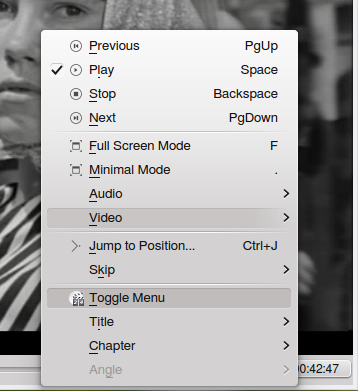 Right click context menu, 'Menus > Navigation (Alt+E)' to access a lot of options on DVD menus. There is also a Menu button on the main GUI (N button on the default skin). SMPlayer has this option as an "experimental feature" disabled by default. It can be enabled and, from what I've tested, it works with mplayer as multimedia engine, but not with the more recent mpv. To use mplayer, go to Options -Preferences - General and select 'mplayer' under Multimedia engine'. Ogle is the first DVD player I heard of that could play menus. It doesn't seem to have been maintained for a decade, though, so I can't say if it would work on current systems. Why do all applications go to the 'Others' App Folder in Gnome Shell 3.8?